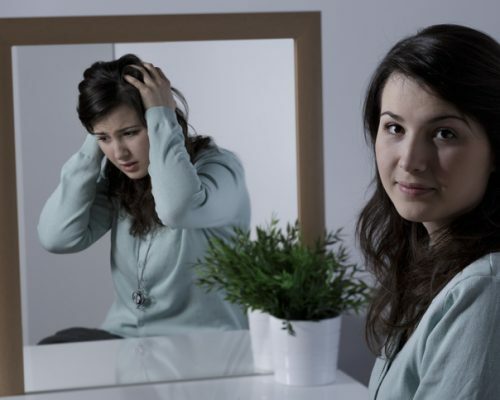 Schizophrenia is a disorder that affects how a person thinks, feels, and acts. Schizophrenics have trouble distinguishing between what is real and what is imaginary. It is a common belief that schizophrenia causes multiple or split personalities – this is not true. Majority of schizophrenic patients are not violent, and schizophrenia is not a result of poor parenting or a lack of willpower. Plus, the disorder affects each patient differently. It has been shown that schizophrenia speeds up physical aging, compared to the general population. It has also been shown that the average life span of a person with schizophrenia is 20 to 23 years shorter than in the general population. Basically, a state of health of a schizophrenic person in their 40s and 50s is comparable to that of a person in their 60s and 70s. Risk factors for schizophrenia include having a first relative with schizophrenia, if your mother experienced problems during her pregnancy such as malnutrition, having a family member with another mental health issue, and having problems with drugs and alcohol. Prodromal phase: This phase is easy to miss and involves symptoms like anxiety and depression. This phase can occur during the teenage years, so the risk of overlooking it is higher. Schizophrenia is rarely diagnosed during this phase. Symptoms may be triggered by stress and may begin with withdrawal behaviors or anger outbursts. Active or acute phase: Hallucinations and delusions may begin to arise during this phase. Thoughts and speech may also get confused at this time. Symptoms emerge slowly. A severe psychotic episode may occur requiring hospitalization. This phase may last for four to eight weeks, and it is during this phase when schizophrenia is commonly diagnosed. Remission and relapse phase: In this phase, treatment helps the patient get back to living a regular life. If treatment helps manage the condition, it is the remission phase. On the other hand, if symptoms begin to worsen again, this is known as a relapse. Patient may go through cycles of symptom spikes and remission. Although hallucinations may not be severe, other symptoms of schizophrenia may worsen, such as neglecting to care for oneself. Over the course of five to 10 years, a pattern of symptom cycles may emerge with fewer relapses occuring.